Collaboration and ﬂexible working are top priorities for many of today’s workers. Businesses need to ensure they meet these needs in order to remain competitive and attractive as employers, but this often means completely rethinking their technology strategy. Employees today want to be able to work wherever and whenever they need to, not just when they’re in the office. They want to be able... to come together to share ideas and they expect the technology they use to help them do this more efficiently. Traditional meeting spaces and solutions are often viewed as more of a hindrance. 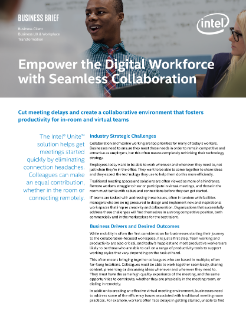 Remote workers struggle to hear or participate in virtual meetings, and those in the room must battle with cables and connections before they can get started. IT teams are tasked with addressing these issues, often in tandem with facilities managers who are being pressured to design and implement new and inspirational work spaces that inspire creativity and collaboration. Organizations that successfully address these challenges will find themselves in a strong competitive position, both commercially and in the marketplace for the best talent.